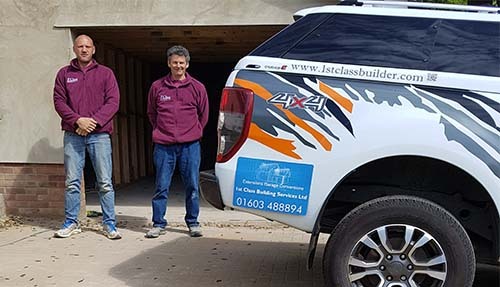 1st Class Building Services are a family business based in Norwich. Our diverse range of building services are provided to customers in Norwich and the surrounding areas. Most of our work comes from word of mouth recommendations and we aim to provide a quality service at a reasonable cost. The primary focus for our website is to showcase ourselves and our services to potential customers. Whilst browsing you will find details of all the services we offer from new build properties to replacing a bath tap. We have included as many photgraphs as possible from completed projects and hope that you will find all the information neccessary to enable you to decide that 1st Class Building Services are right for you.